When I arrived the front desk was undergoing some equipment problems so I was unable to check in right away. They accommodated me well by storing my luggage, offering me coffee and doing their best to to deal with a difficult situation. An hour later, and the computers were running as per normal and I was able to check in without problem. Excellent location! Very helpful and friendly staff. 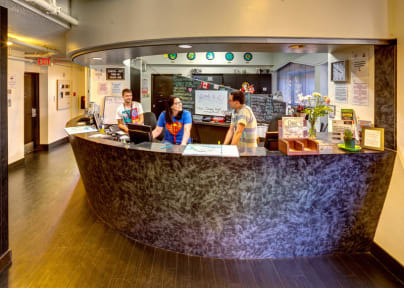 Good hostel, reasonable priced for Vancouver with loads of communal areas & great kitchen facilities. Biggest downside was the only female shower on the floor I stayed on didn't have any hot water & wasn't fixed in the 5 days I was there - could shower in other floors/the other building, but it was pretty frustrating that it didn't seem to be taken seriously. great location and a solid breakfast. Plenty of eating options just a couple of blocks away. Rooms are small, so I was happy that there were only 2 of us in a 4 bunk room. Washroom facilities have been upgraded since I was last here, well done. It would be good to have a seat on the shower area for when you are getting dressed. There is not much room, so maybe a fold down seat could be fitted. Appreciated having the parking available thanks. Will definitely be back again. The staff were very friendly and helpful with any questions I had. They also had good recommendations for things to do or how best to get somewhere. The building itself was a bit run-down, but overall acceptable and comfortable. One of the toilets was frequently backed up and the showers had mold in them, but they were fine for hostel facilities. The room lockers were large enough to fit both my duffel and my backpack. The area the place is located in is very nice. The place itself is kinda rough, I think they can afford to put soap dispensers in the showers and the bathrooms can be cleaner. The elevator needs an upgrade. The wifi works well. The bunks are only better than sleeping on the floor, very difficult to get on and off the top. Didn't stay long enough to eat food from there, I think you can find a better place in Vancouver.